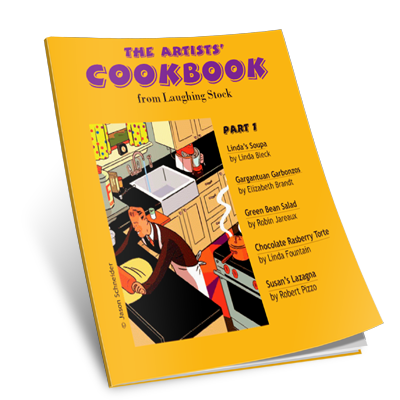 Art Is Like Food... Food Is Like Art... click on the book to browse, enjoy and find out which Laughing Artists are as good in the kitchen as they are at the drawing board. Let us know what you think of the recipes... and if you'd like to participate in the Art Director's/Designer's Cookbook, email us and we'll send you the guidelines. Laughing Stock is an illustration services agency specializing in rights-managed stock illustration, illustrated stock animation, and custom illustration assignments. Search for original stock images, stock animation, review artist portfolios & illustration projects, and assign custom work with our outstanding roster of over 150 illustrators. Complete illustration resources for professional creatives in the publishing, advertising, design, corporate, and new media markets. © Laughing Stock 1993-2011. Rights-managed stock illustration: Images can not be used without proper licensing.